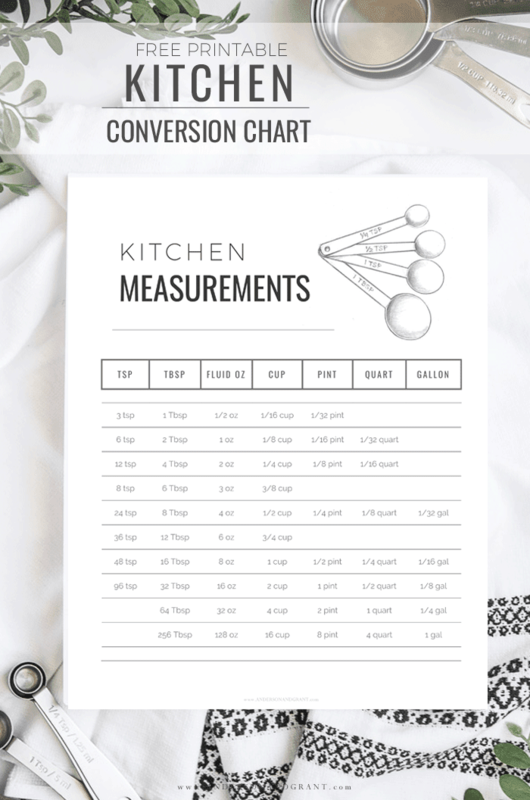 This handy free printable kitchen measurements conversion chart is a life-saver when baking. 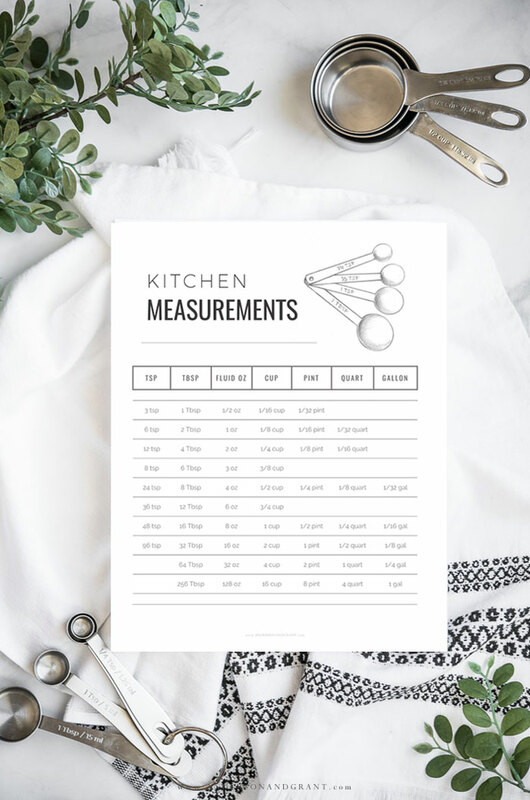 Whether you are cutting a recipe in half, doubling it for a larger crowd, or just don't have the right measurement tool available, this cheat sheet will guide you find the correct amount each and every time....and looks pretty hanging in your kitchen, too! Today I'm joining in with Kristen from Ella Claire and some more blogging friends to share some more free printables with you. This time around, we've created things that can be used every day in your home, like quotes and artwork. Links and pictures for everyone's printables appear near the end of this post. Using exact measurements are crucial when working in the kitchen, especially if you're baking. That is why it is so important to know how to correctly measure out ingredients like flour and sugar. Being off even the slightest can mean that your bread won't rise properly or your cookies will turn out like flat pancakes rather than moist and chewy. There are times when you may want to cut a recipe in half or double it for a large group. And while it is easy to divide 1 teaspoon in half for the recipe, what about a Tablespoon? Or maybe you're mixing up some cookies and realize that the 1/4 cup measure that you now need for flour is covered with the sticky peanut butter you already put in the bowl. Side note: 1 Tablespoon equals 3 teaspoons.....that knowledge has been life changing for me when baking! It's now stored in my memory bank because I've used the conversion so many times in recipes. 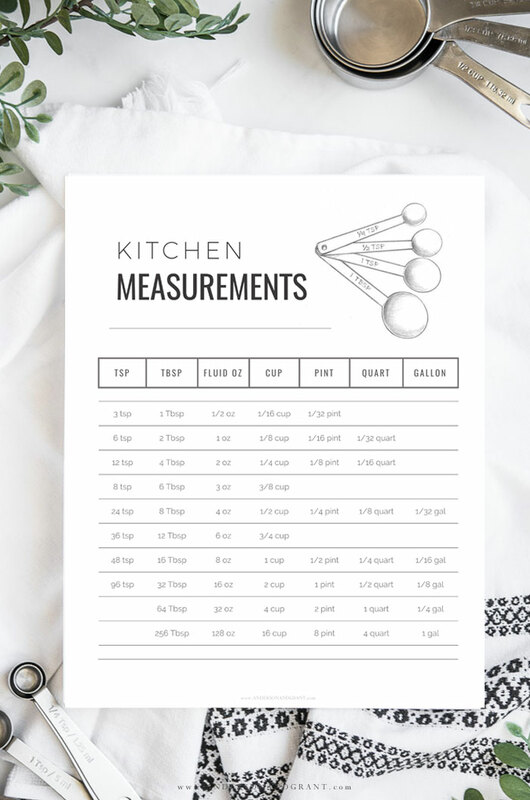 Rather than having to google each and every measurement, I've put together a handy printable for you to keep in the kitchen. That way, it becomes a useful tool as well as kitchen art! All the information you need is right there in front of you. HOW DO YOU USE A KITCHEN CONVERSION CHART? The kitchen measurements conversion chart is a table with columns of measurements. If you follow across the rows the measurements are all equal. So if you're trying to figure out that question about how to divide a Tablespoon in half, you'd first look up the Tablespoon measurement, then look beside it to see that a Tablespoon equals three teaspoons which you could divide in half for your recipe. 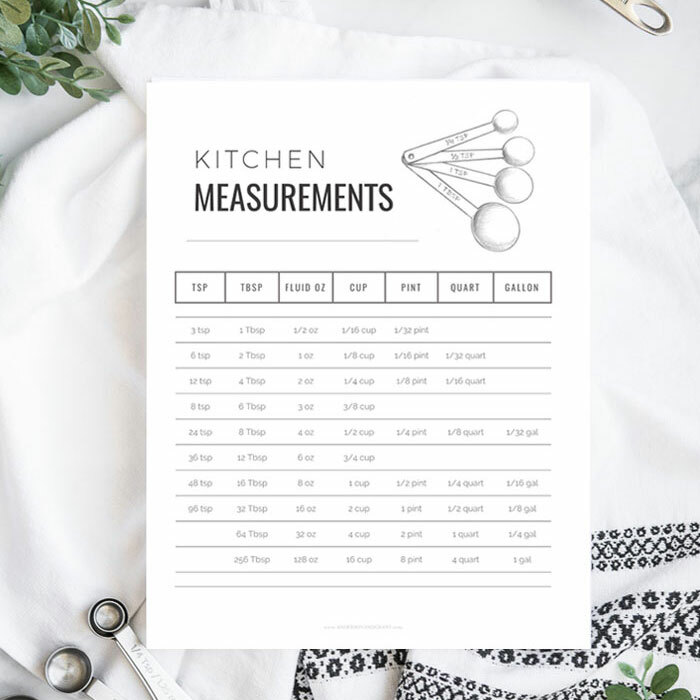 This equal measurements chart is pretty enough that it can be framed and hung somewhere close to where you do your cooking and baking. Or it can be laminated and stored away in a drawer, hung on the refrigerator, or tucked inside a much used cookbook. The lamination is nice because you can easily wipe the page clean from spills that are bound to happen. All you need to do is to download the free printable using the link below, print it out, and either frame or laminate it. So simple, but you'll find it to be so useful! Visit the talented ladies below for more free printables to add style to your home.